Product #46077 | SKU SX620HSBK | 0.0 (no ratings yet) Thanks for your rating! 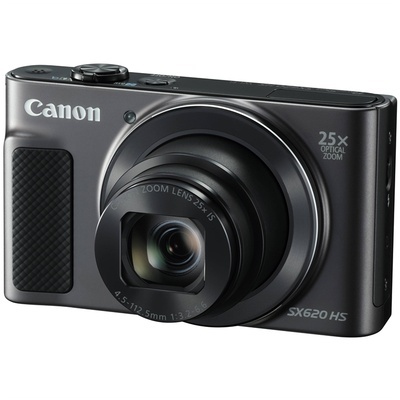 Characterised by its long-reaching zoom, the black PowerShot SX620 HS from Canon is a sleek digital camera featuring a high-resolution 20.2MP CMOS sensor along with a powerful DIGIC 4+ image processor. The sensor and processor combine to form the Canon HS SYSTEM, which produces imagery with notable clarity and quality, as well as reduced noise when working at high sensitivities in low-light conditions. The sensor and processor also permit recording Full HD 1080p video at 30 fps, shooting stills at up to 7.1 fps, and working with sensitivities up to ISO 3200 to suit shooting in difficult lighting conditions. Complementing the imaging capabilities is a 25x optical zoom lens, which covers a wide-angle to super telephoto 25-625mm-equivalent focal length range, and Intelligent IS serves to balance this reach by minimising the appearance of camera shake for sharper handheld shooting. The sleek form factor of the camera is accented by a large 3.0" 922k-dot LCD screen for composing imagery and reviewing your shots, and built-in Wi-Fi with NFC enables wireless sharing and remote camera control from a linked smartphone or tablet. Tripod is a dedicated setting that automatically deactivates IS when the use of a tripod is detected since camera-based stabilisation is not needed. Macro (Hybrid) IS minimises the appearance of shake when walking as well as compensates for shift-type shake that occurs when working with close-up subject matter. Active Tripod IS minimises the slight amount of shake that can happen when recording video while using a tripod. Smart AUTO intelligently selects the proper camera settings based on recognised shooting situations.